The American healthcare system is finally on the road to a modern national IT infrastructure. Recently, the iMedicalApps team had the opportunity to speak to a small but ambitious group of IT professionals who aim to be at the forefront of this modernization by targeting the physicians with the lowest penetration of electronic health records, those in smaller private practices. The web-based EHR put forth by the team at Dr. Chronos, as well as other vendors whom we have spoken about previously, directly addresses many of the barriers to adoption in this physician demographic. 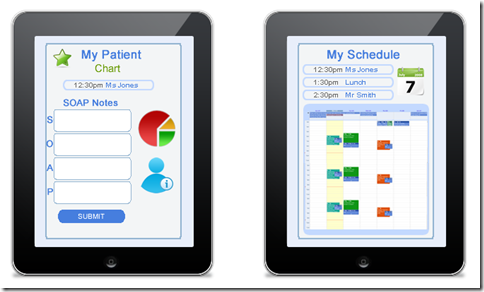 One particularly interesting development is that Dr. Chronos, a relatively new web-based electronic health record vendor targeting smaller private practices, has now decided to embrace the iPad as their mobile health solution. We received a comprehensive demo of the native app for the iPad, including upcoming features, as well as a look at the healthcare IT landscape from the perspective of CEO/Co-Founder Michael Nusimow and COO Daniel Kivatinos. We started the conversation by exploring why they opted to make the iPad their mobile clinician platform. which is what initially led us to set up this interview. The iPad native app that Dr. Chronos released made them the first electronic health record vendor to do so (a more detailed review of the iPad app will be shared in a later post). And they shared some known as well as some surprising reasons for why the iPad was their platform of choice. Mobile Health: In embracing the iPad as their mobile platform solution, they cited the same strengths we previously discussed – the fluid user interface and size in particular. Another feature they cited was the excellent built in microphone, which they have found to be good enough for their built in dictation feature. They also pointed out the 3G connectivity is also helping them overcome a common fear with web-based EHR – office paralysis if the Internet goes down. Now, physicians can continue seeing patients and documenting via the iPad (though billing would have to wait – that can only be done on their web portal). They have built there system to be fully HIPAA compliant by storing practically no information on the iPad, using it just as portal to their secure servers, communication with which is encrypted. So all in all, the iPad presented many advantages leading to it’s viability as a clinician portal to the EHR. Challenges: While the stimulus funds will go a long way in addressing barriers to adoption, it’s not the only challenge to be considered. First, one thing that the Dr. Chronos team has found is that many physicians consider EHR an inefficiency – it slows them down in already packed days. So one guiding principle for Dr. Chronos has been to build a malleable system, which a web-bases system can be, and integrate it on a case by case basis into a given practice – for example, allowing for custom templates to he easily created and uploaded. While the team is currently focused on building in e-prescribing, long term plans include opening up API’s to allow other third parties to build in new features that will enhance their EHR. Overall, the aim is to build a system that is flexible enough to make a physician more efficient, independent of financial and other considerations. Hopefully, this is an approach others will be following as well. Business Model: As with any company, they’ve got to pay the bills and make some money. For many EHR companies, that means rollout fees that are in the tens of thousands, plus high monthly fixed fees. The Dr. Chronos team, as do other web-based developers, have a different model for generating revenue. With startup costs running substantially lower than many office-based systems and a negligible monthly fee, they are trying to make a proposition based on sharing the value created by their system. Founded as a web-based billing management company, they claim that they they can increase the revenue of a practice simply by reducing error rates, improving collection, and so on – essentially all through the advantage of scale, which allows them to operate a dedicated staff and IT system to manage billing. So their revenue is largely generated through a small percentage commission on the billing through their system. I like this approach for two reasons. First, it’s based on the idea that they are creating financial value, ie increased revenue, which the physician and the vendor share. Second, it aligns their interests with the physician – better billing managment means more revenue for both parties. So overall, the business model that the Dr. Chronos team outlined is a very interesting proposition for physicians in their demographic. Dr. Chronos is a relatively young venture and is working on building all of the functionality of a mature EHR (radiology and lab result viewing for example, e-prescribing coming soon). As they continue to grow, I suspect they will continue to be an excellent example of the potential of web based EHR. Why does this interface look like it belongs on a Nintendo Wii? I think they were aiming at friendly and easy to manipulate by fingertip touch. Besides, the only thing more painful than an opaque EHR interface is the training for it. I looked at Dr. Chronos. It is ‘pretty’ looking and pretty basic. Personally, I think they have a lot of work cut out for themselves for it to be useful in a busy medical practice. Here at WWDC, I’m noticing that there is a lot of interest in health care IT projects for the iPad and iPhone. Most of this is from individuals and companies that have significant expertise in the back end functions like servers and cloud-based computing. What they do not have is significant expertise in the front-end user interfaces that clinicians experience. This is no surprise because as difficult as it is for a primary care physician like myself to imagine how a CV surgeon interacts with an EMR, for an IT person they may as well be on another planet. I would be very cautious about any vendor who claims to have an iPad component ready to go. Nobody had these devices in their hand prior to April. There’s a lot of pressure on these developers to throw something together in a few weeks and move on to the next client that wants “something for the iPad”. why can’t some of the established products like amazing charts and eclinical works get themselves up to speed for iPad use. I would love to give up my lap top and use an iPad as I go from room to room. Welltheon is another great EMR software that is compatible with the iPad http://www.welltheon.com for more info. It is an SaaS software that is very affordable ($199 to start) and works great.